After some back and forth of discussing the color of the widget title border, we decided that we should go for a contextual coloring for now: orange (as a warning color) for outdated sites, and red (as an error color) for insecure sites. However, only after the meeting, we realized that there would hardly be any occasion for us to show the orange warning-type bar. It is important to not rely on color alone for conveying information, for accessibility reasons. We agreed that the efforts to make the widget less visually jarring should avoid downplaying the sense of alarm too much, as that defeats the purpose. The wording of the widget was rediscussed again. However, the result was confusing because not everyone was referring to the most recent state of the widget. We finally didn’t budge from what was concluded last week: the editorial version is good with the exception of the word “guarantee”. We discussed adding a visual symbol, like an exclamation mark, that provides more of a visual cue than the red border. I’ve added a new path with screenshots to the patch that does just that: This also makes the widget still quite noticeable when collapsed. Next meeting will take place on Monday, April 23th, 2018 at 15:00 UTC in #core-php. Agenda: Discuss latest version and the use of the exclamation mark symbol. @schlessera thanks for the update! 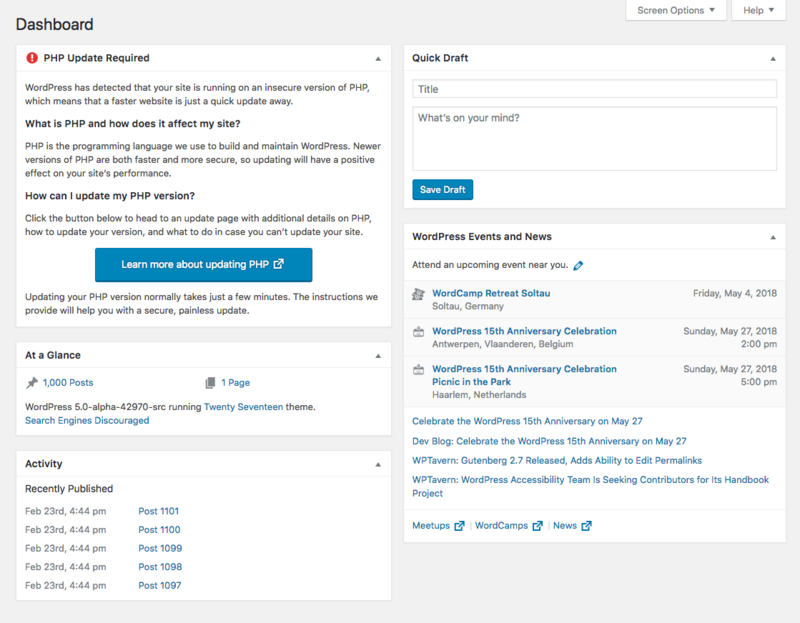 WordPress has detected that your site is running on an insecure version of PHP, which means that a faster website is just a quick update away. Was there a reason for that particular phrasing? The reason I ask is the second part of the sentence doesn’t really relate to the first part. Insecurity and speed aren’t the same thing, so the mention of a faster website in the context of an insecure PHP version seems like a disconnect. I agree. Read literally, the sentence is not true. Running an insecure version of PHP does not, in itself, mean what the sentence says that it means. Yes. This is really wrong. Speed and security have not any relevancy. In my opinion, this is an unintentional mistake.